Kanchana, my wife had an old P4 machine from back in the days before we met. It was a PC House branded G-Max. Anyways, she's been wanting to fix it up and give it to her sister to use and so we'd figure it would be a good B' day gift for her. So last weekend, about this time, I was sweating it off trying to put it back together in time for April 25th, her B' day. We'll it began a couple of days earlier, 23rd to be exact, when we picked it up from her parents place and cleaned it up and tried plugging it in. For better or worse, nothing happened - nothing worked. At least this thing wasn't going up in smoke. I removed the casing which was slightly more difficult than usual as a result of the case design. You couldn't pull out the motherboard because the CPU fan hits the CDROM and you couldn't pull out the CDROM for exact same reason. So I removed the power supply, slid the motherboard and lifted it up once the CPU fan was in the clear. The fun part was cleaning off the layers of dust and the few cockroach eggs that could be seen on the chassis. After blowing at the board frantically, I know I needed some sort of compressed air. Not having it, I improvised with my deodorant spray which did the trick. After letting the deodorant alcohol to dry, I went about setting up the system on top of a piece of wood. To my pleasant surprise it turned on, after shorting the jumper pins that would otherwise be connected to the power switch. As expected the CMOS battery was dead and needed replacing, which I did. 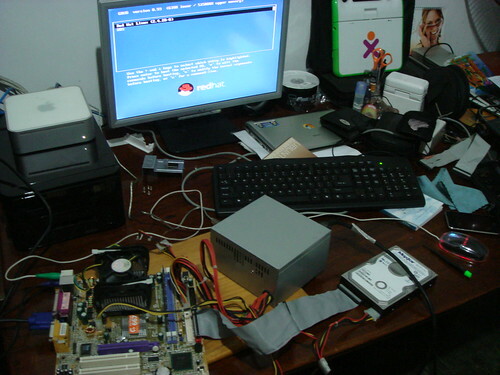 I also thought it would be good to upgrade the CDROM to a DVD ROM/Writer which I had lying around. This proved quite difficult as it was impossible to get the CDROM from the back and getting it from the front proved quite difficult. There was no straight forward way of getting the front blue panel off from the casing and I struggled for at least half an hour. A half and hour and a bucket full of sweat later I just ripped it off damaging just one revert in the middle. Fortunately this wasn't a big deal as I was able to upgrade the CDROM and reattach the panel. Timing was good as Ubuntu Jaunty 9.04 had been released just a day earlier so I slapped that on while wiping out Windows XP and Redhat 9. Despite the machine being several years old, everything worked quite well, even with the 512MB ram it had. The machine booted in under 20 seconds thanks to the bootup optimizations found in the new Ubuntu. Unfortunately 3D (compiz) did not work even though it had a built in Intel 945 graphics. Since she was into media, I installed inkscape, skype, elisa, audacity, sinhala stuff and various codecs needed to get by. To top it off, we bought her a 17" View Sonic flat panel display which cost only 13K - not bad IMHO. Overall she was quite happy and has somewhat gotten used to working on Linux. A couple of days ago she commented that it was becoming easier to use - easier than Windows XP. Hey good to see a post after a long time :). We kind of missed the geek with an attitude.